Google Pixel 3 XL review | What Hi-Fi? But with an excellent OLED screen and superb camera, this is still a great handset and shows Google’s Apple alternative is every bit as alluring for the undecided consumer. Such is the curse of the new smartphone in 2018, that the Google Pixel 3 XL is new, but at once instantly familiar, undeniably impressive but somehow underwhelming. Full to bursting with amazing technology, the Pixel 3 XL is one of the best big-screen flagship phones on the market, and for serious fans of the Google ecosystem, perhaps the best yet. But thanks to only incremental improvements, those already on the cutting-edge of mobile tech might be hard pressed to find much new here. The Pixel 3 XL is an all-glass affair, rather than a split glass and aluminium build, but the two-tone styling remains. The button layout is the same, though the SIM card tray has moved to the bottom rather than the side, with the fingerprint unlock on the back. There’s still no headphone jack, with the same USB-C connection as on the previous Pixel phones and is increasingly found on most Android devices (and now the Apple iPad Pro). What’s new is a bundled pair of USB-C earphones, though there’s still a 3.5mm-to-USB-C adapter for connecting your standard headphones, too. You’ll have to turn it on to notice, but one of the most talked-about design features is the Pixel 3 XL’s notch. Following Apple’s lead, the notch design around the front-facing camera has rapidly become a standard design on high-end handsets. The Pixel 3 XL seems to have one of the more obtrusive takes on the notch, but in our experience you’ll either become accustomed pretty quickly or realise that you can, in fact, just hide it by making the top of the screen black on either side through the settings menu. Yes, you lose a little screen real estate at the top but we found that our preferred option. That said, if you really don’t want a notch, you could opt for the notch-less Pixel 3. 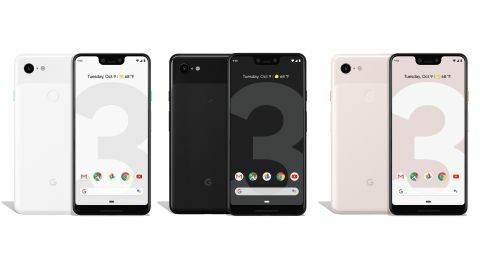 As with the previous Pixel phones, the 3 XL is available alongside the Pixel 3, a smaller, but similarly-featured version of the hefty handset. The 9g-heavier Pixel 3 XL is nigh-on identical to the Pixel 2 XL in the hand – something that proves to be a theme with this phone. At 6.3in, the Pixel 3 XL’s OLED screen is slightly smaller than iPhone XS Max, bigger than the iPhone XS and iPhone X and pretty much comparable to other big-screen Android phones, such as the Samsung Galaxy S9 and Galaxy Note 9. Despite having a larger screen, the 3 XL is nigh-on identical in size to the 6in 2 XL, its slimmer bezels and flatter edges helping here. The 2960 x 1440 resolution is only a slight increase on the Pixel 2 XL, so the larger screen results in 523 PPI, which is actually slightly lower than the previous model. There’s not much in it, however, and it doesn’t have an adverse effect on the screen performance. There’s no microSD card slot for internal storage so you’ll have to make do with the 64GB or 128GB hard drive options. The 3 XL’s 3430 mAh battery is slightly smaller than its predecessor, unlike the Pixel 3, which has a boost over the Pixel 2. But thanks to the faster 2.5GHz processor, 4GB RAM and new Snapdragon 845 chip, there’s no adverse effect on the battery life. Wireless charging is here, though you’ll need to shell out extra on a Pixel Stand or a similar charging accessory. Otherwise, it’s a slick, fast, long-lasting experience – the battery life here is solid, lasting a full day of use no problem, with the added bonus of rapid charging, which gives you 50 per cent charge in under an hour. The OS is Android Pie, previously known as Android P, the ninth version of Android. It comes on all Pixel devices as standard, while it will roll out to other phones in beta mode over the coming months. Much like the design and specs, it’s difficult to see a huge leap in performance from the previous operating system, but it remains a slick user experience. The advantage of Google phones, from the original Nexus models through to the current Pixel phones, has always been the clean Android experience. Most rival Android handset manufacturers have also moved to soft-touch versions of the OS, with little unnecessary bloatware, but nevertheless the Pixel 3 experience remains the smoothest Android OS experience. As the software edges closer across handsets, Google now uses features as a differentiator, with the latest Android features arriving first on Google’s own phones. Features such as Google Assistant and Google Lens seem more immediate than ever, both in their more front-and-centre presence on the Pixel 3 XL but also in their speed and quality of recommendations. Elsewhere, the new gestures and swipes that arrive with Android Pie are intuitive and responsive. We like the swipe up to reveal your five most popular recent apps, before an extra swipe takes you to your full suite of apps. Swiping across the bottom of the screen to move from app-to-app takes a little time to make sense of, but the fluid motion is strangely addictive. We did notice the odd occasional lag in comparison to the Pixel 2 when unlocking with the fingerprint sensor, and more noticeably in making contactless payments, but these millisecond differences will hopefully be ironed out as the software improves. We were underwhelmed by the Pixel 2 XL, and while the sonic characteristics have changed, it’s still not a class-leader when it comes to audio quality. It is beaten by phones such as the iPhone XS Max and the Samsung Galaxy S9+. Listening to lossless quality Tidal streams the Pixel 3 XL sounds fuller-bodied than its predecessor, with the treble not as forward, but it still lacks dynamics and excitement. Carl Craig’s The Melody lacks punch, sounding lacklustre as a result, while Ella Mai’s Boo’d Up sounds lightweight. Missing nuances means we’re not drawn into tracks as we might be on more accomplished players. Inside the box you’ll find the new Google Pixel USB-C earbuds. The buds sit quite loose in your ears rather than burrowing into your ear canal, making it tricky to get a good seal. The cable hook design does its best to help them stay in your ears. A good pair of budget in-ears such as the Beyerdynamic Byron earphones would be a better bet. There’s no headphone jack here so you’ll need to use the adapter to connect traditional wired headphones. You can of course go wireless if you prefer. Again, we can’t help but compare to the Pixel 2 XL when it comes to looking at the Pixel 3 XL video performance. And our eyes are instantly drawn to the larger OLED screen – the fact Google has squeezed a bigger screen into a same-sized handset is an instant win. The screen performance has been improved, too. Whites are cleaner and punchier, while colours are more dynamic; the Pixel 2 XL looks a touch dull by comparison. There’s an extra layer of subtlety and detail, which makes us feel closer to the action when watching HD NFL highlights on YouTube. The improved colour balance and extra detail carries across to the camera. The Pixel 2 XL already had one of if not the best smartphone cameras, marrying excellent hardware with some innovative software. The Pixel 3 XL continues that fine work, adding an extra 8MP front camera with a wide-angle lens to the existing 8MP and 12.2 MP rear camera combination. Pictures are natural, detailed and impressive in low-light situations, and better than any flagship Android rivals. Google’s Night Sight camera mode, in beta at the time of writing, almost gives the phone night vision. For those who want to just point and shoot, results are superb – but the extra features are easy to experiment with if you want to chance your arm. It’s easy to become blasé about what’s on offer from the latest smartphones. The Pixel 3 XL isn’t revolutionary, nor does it offer a giant leap forward from its predecessor. But if you want a big-screen Android phone for taking photos, watching videos and everything else you can do with your phone, there might not be a better option. Our only gripe comes with the audio quality; which means if you do want the optimum music performance into the bargain, there are better options around.